Judges Kristina Cook Graham, left, and Don Thompson pose with Gretchen Neal, center. Graham and Thompson have hired Neal as coordinator of Lookout Mountain Judicial Circuit's adult felony drug task force. Gretchen Neal, a local banking executive, will manage day-to-day operations for the new Lookout Mountain Judicial Circuit Adult Felony Drug Court. Judges Don Thompson and Kristina Cook Graham named Neal as the operation's coordinator in a news release Friday. Neal comes to the post after working as a branch office administrator at Edward Jones Investment Co. in LaFayette. Before that, she worked as the vice president and manager of two Cohutta Banking branches in North Georgia. According to the news release, she has worked with men in recovery from addiction at her church, The Wesleyan. She is the wife of Jay Neal, the executive director of the Criminal Justice Coordinating Council. 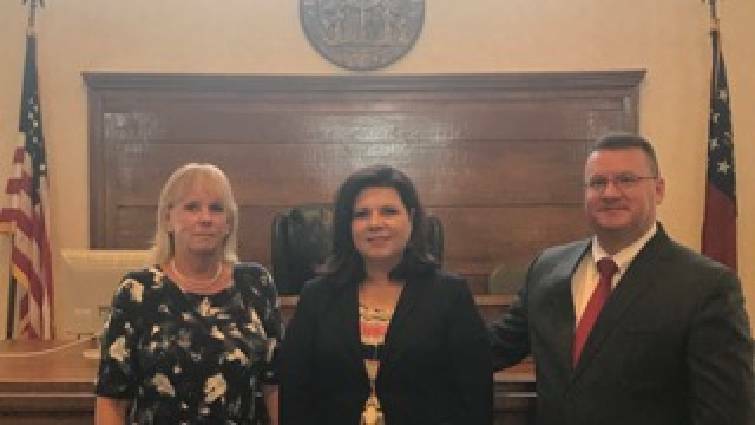 Last month, Jay Neal signed off on a $150,000 grant to Walker County to help launch the drug court. The grant included $70,000 for the coordinator position now occupied by his wife. Graham said Friday Gretchen Neal's marriage had nothing to do with her hiring. She liked that Mrs. Neal's experience in banking included managing several employees. She said a key aspect of the job will be coordinating with drug court participants, counselors, prosecutors, public defenders and judges to organize day-to-day operations. Graham said she thinks she and Thompson received more than 30 applications and interviewed several qualified candidates. Gretchen Neal's enthusiasm stood out to them. "We don't need a lawyer or counselor," Graham said. "Those will be other team members. But the coordinator will work with the criminal defendants and the other team members to put together the recommendations. We need somebody who can work with people and manage people." Gretchen Neal did not return a call or email seeking comment Friday. She will undergo training in the next couple of weeks through the state's Council for Accountability. "We are pleased to have someone with Gretchen's significant community involvement joining the team," Thompson said in the release. "As someone who knows and is known by the community, we know she will provide valuable inroads to organizations and individuals who can assist in making a difference in the lives of those coming before the Court." Accountability courts have been a priority in Georgia under Gov. Nathan Deal, whose son has been a drug court judge for years. From 2013-16, the state increased funding for such courts by 752 percent, from $2.7 million to $23 million. Drug court gives defendants with addiction problems an opportunity to avoid jail or prison, instead allowing them to go through a program. They must go to a reporting center several times a week, meet with counselors and submit to drug tests. If they don't abide by the rules, a judge can send them to jail as punishment — though that doesn't mean they're necessarily out of the program. Participants can graduate from drug court once they've completed several objectives. This can take years. As of 2016, the Lookout Mountain Judicial Circuit was one of two circuits in the state without any accountability courts. The Lookout Mountain circuit consists of Catoosa, Chattooga, Dade and Walker counties. Graham said she expects the program to launch this fall.